Jean Kazez: Is it selfish to procreate instead of adopt? Is it selfish to procreate instead of adopt? 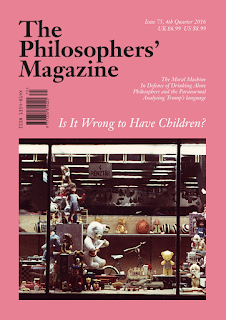 Adam Ferner asks this question in a video publicizing the procreation forum in the new issue of The Philosophers' Magazine (which I guest-edited)--it's a question that is addressed by many of the authors that contributed to the forum (Gerald Harrison & Julia Tanner, Sarah Conly, Bernard Prusak, Tina Rulli, Elizabeth Bricker, Rivka Weinberg). I won't try to summarize the debate in the forum--you should subscribe to the magazine so you can read it!-- but can't resist responding to Adam's question. For another response, have a look at the various points Denise Cummins makes here. As an adoptive mother and cognitive psychologist, she has a lot of relevant expertise and experience. Adam's response is Yes--procreating is selfish, because (roughly) adopting benefits an existing child in need of parents, whereas procreating brings a brand new child into existence, a child who would not have been in need of rescue if they'd remained non-existent. And on the other hand, adopting provides just as much of the most important kinds of satisfaction for parents. So far procreating just sounds irrational. It starts to seem selfish if you add that people choose procreation (despite the superiority of adoption) out of some sort of selfish preoccupation with their "lineage". To begin with, we need to ask why anyone wants to have a family. It clearly doesn't come from a desire to make children better off. If you had that desire, you wouldn't procreate and probably also wouldn't adopt. Rather, you'd take the hundreds of thousands of dollars you could invest in having your own family and donate it to a children's charity or maybe to an orphanage in a developing country. Surely you'd do more good by helping 100 (or so) children simply survive and live a decent life than by creating one brand new affluent child or by bringing one struggling child from dire straits in an orphanage to an affluent home. If you opt to have a family instead of doing the most beneficent thing, can you be accused of selfishness (whether you procreate or adopt)? Well, I do think wanting a family has something to do with the self. If you were a perfect Christian, perhaps you neighbor would be self-like to you--you would love your neighbor as yourself--but for most of, one of the few ways we have of expanding the self is through having children. If you do have a child, out of wanting a child (as opposed to accidentally), it's very likely you will have all sorts of attitudes toward the child that come close to the attitudes you have toward your very own self. Your level of generosity to the child will be like the one you have toward yourself; your non-competitiveness with yourself will hold also for your relationship with your child; you'll nearly feel your child's pain; you'll care about her future like you care about your own. And on and on. So having a family gives us a sort of self-expansion we are unlikely to experience without it. So what of adoption vs. procreation? Isn't it possible to have continuity, projection into the future, expansion of the self--all that good stuff--by adopting children? It's possible, but "possible" doesn't mean "possible for everyone." Adam cites studies that show that adoptive parents love their children just as much, but these aren't randomized trials! They don't show that if just anyone were to choose adoption over procreation, they would love their children just as much. The people who do are those who willingly did choose adoption. What about the Unables--the people who feel unable to love a child as a second self, unless the child is related? Once again, there's potentially room for making a moral judgment. The Ables are good, the Unables are bad--they're selfish. But that seems much too judgmental. It makes good sense that a child's coming from you, and being continuous in various ways with you, does tend to make the child matter to you in a self-like way. These are the sorts of factors that make our very own future selves our selves, and our future selves clearly do matter to us in a special way. So I'm not prepared to judge the Unables negatively. But what of the Ables? Is there something better about their outlook? You might reasonably say they're better because of their greater openness to unrelated people. But calling the openness of the Ables a virtue doesn't force us to see the Unables as having a corresponding vice. There's such a thing as being too closed to unrelated people--thinking they don't matter at all, at the most extreme-- but it doesn't seem like the Unables are at that end of the spectrum, just because the alchemy of self-extension only transpires, for them, in the context of procreation. Bottom line: people who adopt may indeed have character traits that are especially good. That doesn't mean procreators have bad character traits--they're selfish!--let alone that they behave impermissibly. If you want to stop people from denigrating adoption (and maybe some still do denigrate adoption), the reasonable way of doing so is not by denigrating procreation. Yeah, that was all a bit dense and complicated. My argument here is laid out here in much greater detail in my forthcoming book The Philosophical Parent: Asking the Hard Questions about Having and Raising Children (Oxford University Press, July 2017). It's kind of weird to think of the unables as have a vice of sorts.... you're right.... but if we go down this line of thinking that people who fail to have certain emotional experiences, consequently fail to have some kind of moral duty I think we're going down the wrong path. Would it be okay for people not to be vegetarians simply because they fail to have the empathy with animals? I'm not prepared to say that, but I'm not sure how the analogy fails. On the other hand, if the ables are able to love children that aren't their own, then shouldn't they ought to adopt? It strikes me as a moral obligation to adopt a child over procreating, if that's a plausible possibility (you're an able). In that case, it might just be wrong for you not to adopt. I've also heard of people who "split the difference"-- procreate and adopt. But that also strikes me as wrong.... You should just adopt and adopt. Maybe another analogy might be useful.... People routinely argue that we should adopt pets from the humane society or other rescue groups, rather than breed animals our selves or purchase from breeders. No sense in breeding more animals, when we already have an overabundance of animals to choose from. If its wrong to get an animal from a breeder or to breed your own animal, it might be equally wrong to breed your own child.